As data becomes more integral to research publications, the question of how to display the data obviously but unobtrusively to the reader becomes more difficult. Academic Publishers are looking for technologies that allow them to bridge the data gap between publication and research data deposits easily. In this presentation, OUP reports on a pilot project with IT Services to convert originally static data visualizations within publications into rich, interactive and explorative tools. The R web framework Shiny was used to allow researchers to develop the interactive tools themselves, negating the need for expensive dedicated web developers, and providing the ability to pull data directly from data repositories such as Figshare. 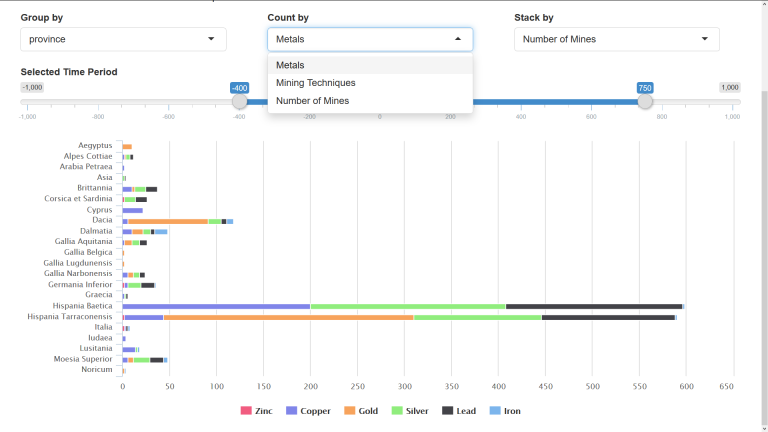 OUP will continue to build on the lessons learned from this project and hopes to work with more researchers to build interactive data visualizations to accompany their publications. Richard O’Beirne is the Journals and Digital Strategy Manager (Global Academic Business) at Oxford University Press. Martin Hadley is an Academic Research Technology Specialist at the University of Oxford’s IT Services. Image credit: OUP University of Oxford IT Services Live Data Project. Biography is only one of many disciplines that have been deeply influenced by advances in digital media and computing, and that have required new theoretical approaches to help understand the changes. Yet the digital revolution has arguably had a more profound effect on biography and life writing than on any other branch of literature, perhaps any branch of the arts. At the intersection of biography and digital humanities, key questions can be posed: In what ways does the Web act to co-shape our identities? Do we know ourselves, each other, or historical actors differently? 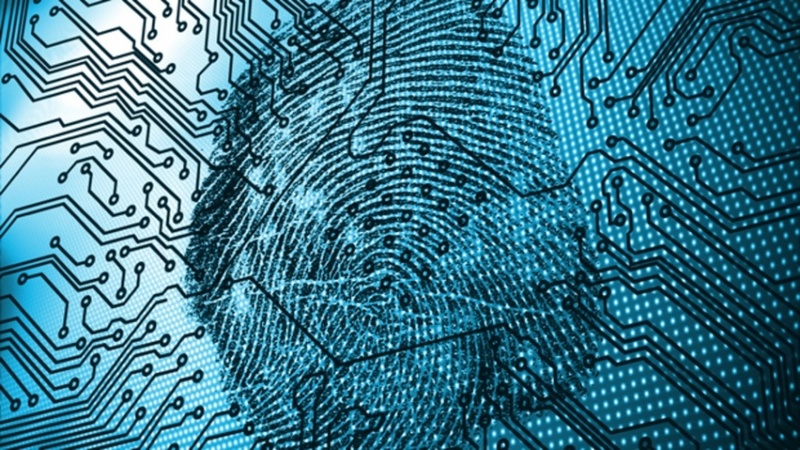 How permanent are the digital records of lives that are being produced? Do we, or will we soon, remember differently? And, what are the research futures for digital biographical research? Paul Arthur is Chair in Digital Humanities and Social Sciences and Director of the Centre for Global Issues at Edith Cowan University, Australia. He was previously Professor in Digital Humanities at Western Sydney University. From 2010–2013 he was Deputy Director of the National Centre of Biography at the Australian National University, and Deputy General Editor of the Australian Dictionary of Biography. Recent publications include Migrant Nation (in press, 2017, ed. ), Private Lives, Intimate Readings (2015, ed. with Leena Kurvet-Käosaar), and Advancing Digital Humanities: Research, Methods, Theories (2014, ed. with Katherine Bode). The internet is becoming an increasingly dominant feature of social life in the western world. More and more users rely on platforms such as Facebook, Twitter and Google to receive news, communicate with others, share content and conduct everyday tasks. As this reliance grows, it is important to ask questions about how we ensure safety and fairness on the internet. For instance, how can we limit the spread of harmful content such as rumour and hate speech on social media? How can we ensure that the algorithms that filter much of the content we see produce results that are both accurate and unbiased? What can we do to protect vulnerable users online? In this talk we describe two projects that seek to advance safety and fairness online. We report on the findings of the Digital Wildfire project, which investigated opportunities for the responsible governance of social media – in particular looking into how we might prevent and limit the spread of hate speech and rumour online whilst also protecting freedom of speech. We also introduce the UnBias project, which investigates the user experience of algorithm-driven internet services and the processes of algorithm design. This project focuses in particular on the perspectives of young people and involves activities that will 1) support user understanding about online environments, 2) raise awareness among online providers about the concerns and rights of internet users, and 3) generate debate about the ‘fair’ operation of algorithms in modern life. Helena Webb is a Senior Researcher in the Department of Computer Science at the University of Oxford. She works as part of the Human Centred Computing Group, which examines the inter-relationships between computing and social practices. She is interested in communication, organisation and the use of technology in everyday work and life. Most recently she has been working on the Digital Wildfire and UnBias projects. Menisha Patel is a researcher working within the Department of Computer Science at the University of Oxford. She is part of the Human Centred Computing Group, and her work focuses around both fine-grained and more systemic level social issues surrounding the design, development and integration of technologies into our world. She is interested in how we can use micro-level approaches, informed by ethnomethodology and conversation analysis, to understand and assess the design and use of technologies both in the workplace and also in prototype form. Her recent work has been within the field of “responsible research and innovation” (RRI), where she has worked on projects concerning how we can integrate more responsible practice into the research and innovation procedures and processes, to engender more socially and ethically desirable innovation. Imaging systems have been developed over the years to capture images of objects which are more detailed, have accurate colour and have revolutionised our records of our cultural heritage. Some objects have subtle surface details which are difficult to capture. We have been using a technique called “reflectance transformation imaging”. This allows the viewer to move a virtual light around to highlight the detail of interest. This talk will explain the technique and show the systems we made to capture hundreds of images. 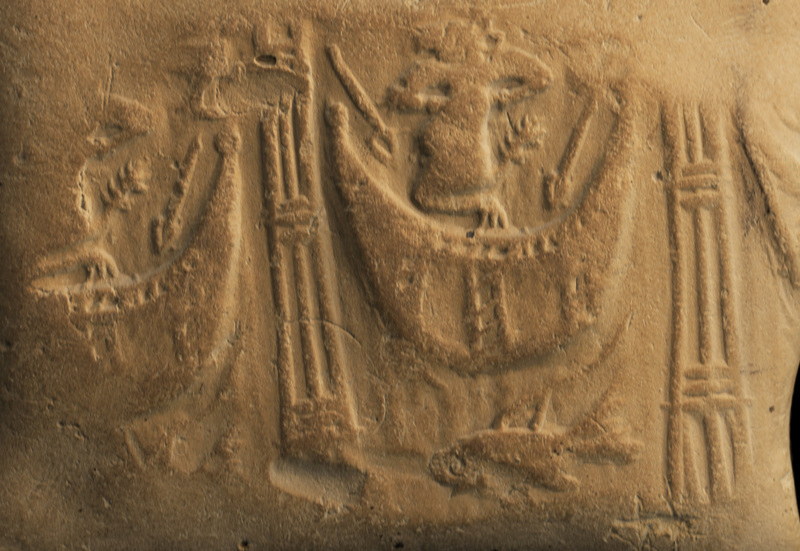 Seal impression on the proto-Elamite tablet Sb 04832 captured from an RTI dome image made in the Louvre. Credit: Cuneiform Digital Library Initiative; http://cdli.ucla.edu/P008022. Jacob Dahl is a specialist of the pre-Classical cultures and languages of the Near East. He has written on early Babylonian socio-economic history, early Near Eastern writing systems, and Sumerian literature. He works on the decipherment of proto-Elamite, the last undeciphered writing system from the ancient Near East with a substantial number of sources (more than 1600 tablets divided between the Louvre Museum and the National Museum of Iran). Initially inspired and influenced by archaic cuneiform from Mesopotamia, proto-Elamite was a very short-lived writing system (ca. 3100 – 2900 BC) used across much of what today constitute the Islamic Republic of Iran.As a co-PI of the Cuneiform Digital Library Initiative he seeks to document and safeguard Mesopotamia’s contribution to our shared world history by making its ancient records available freely online. Booking: no booking required: just turn up! We are delighted to welcome two of the leading lights of the Yorkshire Sound Women Network (YSWN), Liz Dobson and Amy Beeston, to Oxford where we will be co-hosting a meet in a cafe—YSWN on tour! 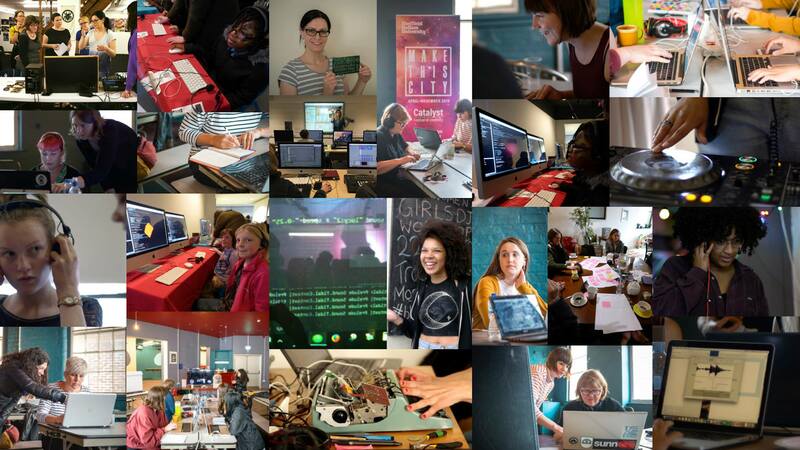 YSWN’s glorious mission is to inspire and enable more women and girls to explore sound and music technology. This first meeting in Oxford marks the start of our own sister network, supported by the Fusing Semantic and Audio Technologies project. Women and girls of all ages are invited to come together to meet new people and talk about sound and music technology in an informal setting, tea and cake provided! There is no pressure to share work with the group, but if there is something you would like to bring along for people to look at/listen to you are more than welcome. If you would like to find out more about YSWN, you can join their mailing list through their Facebook page. There is more information about the network in Sheffield through the Sheffield YSWN Facebook group or Sheffield YSWN Google group. You can also read more about the series of workshops which took place in Sheffield as part of Catalyst:Festival of Creativity. For more information about this event, please contact pip.willcox@bodleian.ox.ac.uk. For any queries about YSWN’s events please contact yswnsheffield@gmail.com. I am a postdoctoral researcher at the University of Sheffield, working in the ‘Speech and Hearing’ and ‘Music Mind Machine’ research groups. I develop tools to extract meaningful data from audio signals, and am particularly interested in using principles of human audition to improve the performance of machine listeners in everyday environments. I am the Head of the Centre for Digital Scholarship at the Bodleian Libraries, and a Senior Researcher at the University of Oxford e-Research Centre where I work on the EPSRC project, Fusing Semantic and Audio Technologies for Intelligent Music Production and Consumption (EP/L019981/1). I co-direct the Digital Humanities at Oxford Summer School and convene its introductory workshop strand. With a background in textual editing and book history, my current work investigates narrative and the intersection between the material and the digital, exploring the experimental humanities. Our colleagues invite applications for a hackathon, 13-14 May 2017. Are you interested in the ethical and social effects of technologies? Come to the ethicon event, 13-14 May! We are very excited to be running a new kind of event here in Oxford. The ‘ethicon’ is a twist on the hackathon. Participants work in teams to design a prototype system to solve a particular challenge. However in addition to thinking through technical details they also need to identify the potential social and ethical effects of the particular technology and find creative ways to address them. To assist with this, participants are put into groups so that students from computer science and social science/humanities/business backgrounds work together and learn from each other. The groups’ ideas are then judged by a panel of experts and prizes are available to the winning teams. Each team will be made up of two technical undergraduates (from computer science or a related discipline), plus two non-technical team members from areas such as social sciences, philosophy, business (and who have an interest in ethics) from any UK University. Deadline 5 May. Details about how you can apply to take part are on their poster and: https://cybersecuritychallenge.org.uk/news-events/part-first-ever-ethicon. If you have any questions about the event, please email helena.webb@cs.ox.ac.uk. Registration is now open for this joint Folger Shakespeare Library and Bodleian Libraries conference! 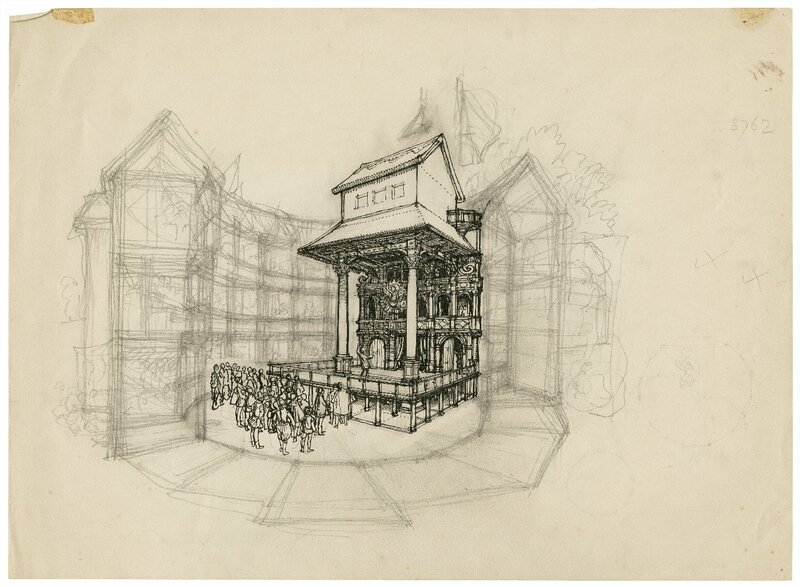 C. Walter Hodges (1909-2004), “Cutaway view sketch of the Globe Playhouse,” Folger Shakespeare Library Collection. The Bodleian Libraries and the Folger Shakespeare Library will convene a conference from 10-12 July, 2017, on digital explorations of the early modern theatre archive. We are interested in applying approaches from other disciplines, genres, and time periods which can prompt new thinking about the ways we preserve, describe, research, and teach the early modern stage; as well as in hearing from early modernists who engage with their subject through digital means. Seeking to foster a spirit of collaborative experimentation, we invite proposals in the full range of project completion taking the form of 20-minute papers, as well as “lightning talks,” panel discussions, multimedia presentations, and others. Invested in both material and method, Digitizing the Stage is a singular opportunity to consider the future of the early modern archive. Attendance will be limited to 100 participants, with registration opening shortly. For more information, please see the conference website. 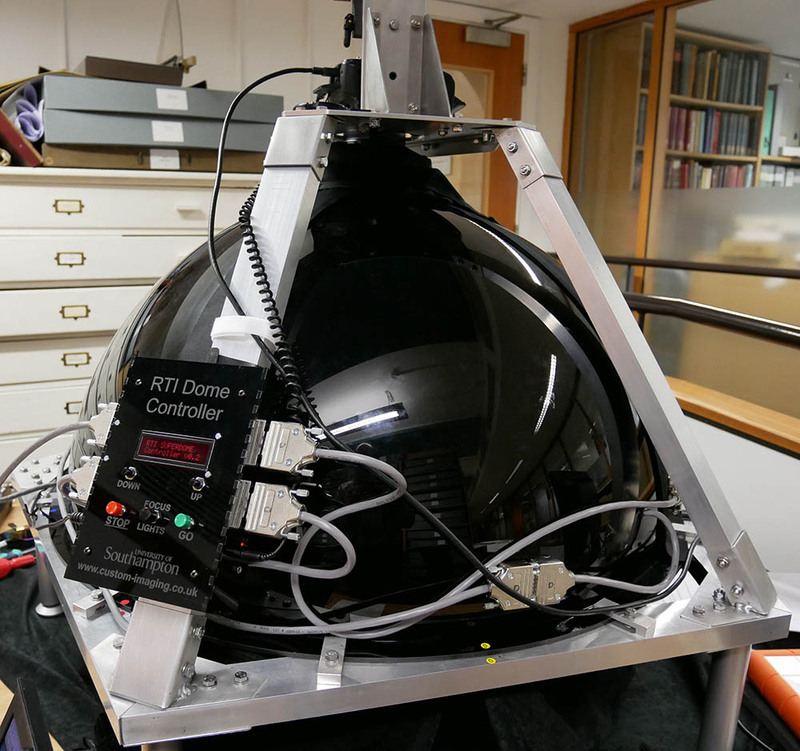 Digitizing the Stage is organized by the Centre for Digital Scholarship, Bodleian Libraries; the Folger Shakespeare Library; and Professor Tiffany Stern, Royal Holloway, University of London. The front page of English Wikipedia gets around five million hits per day. Highlighted sections of the page, such as “Did you know” and “In the news” trumpet the site’s purpose: sharing knowledge for its own sake. One of these sections, “On this day…” features five different facts each day, with links to relevant articles. These facts in turn are chosen from a large collection of roughly 100 historic events for each date. Many other language versions of Wikipedia have a similar “This day in history” section, though with different sets of facts. As with everything else on Wikipedia, this collection of historic facts is offered freely for anyone to use for any purpose. “On this day in history” facts are ideal for sharing on social media, for example by Wikipedia’s official presence on Twitter. Napoléon Bonaparte, listed in Wikipedia’s May 26 article for his coronation as King of Italy on 26 May 1805. 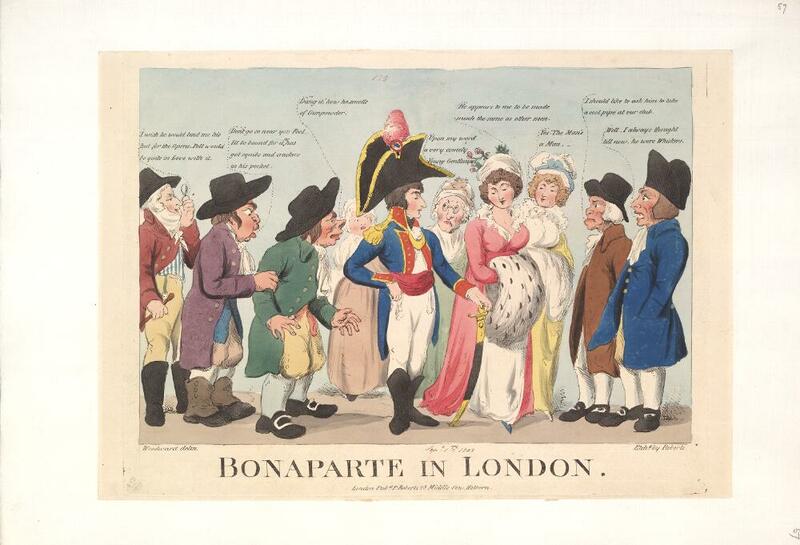 Image from the Curzon Collection of political prints, CC-BY the Bodleian Libraries. To avoid repetition from year to year, it helps to be able to draw on a large pool of historic events, so each day can showcase a variety of types of event, of locations and of eras. There is a relative shortage of events before 1800, so additions are welcome. Being featured on the front page generates a lot of interest in the article. The Alhambra Decree article typically gets about 300 views per day. When linked from the front page as a recent “On this day” item, it had nearly 10,000. The Treaty of Fontainebleau (1814) article gets 70 to 80 views on a typical day, but had 5,400 when linked from the home page on its anniversary. The article about Suvarnadurg, an Indian fort, usually gets around 30 views a day, but had 8,500 when the fort’s 1755 capture by the East India Company was listed on April 2. By considering one example, we can look at how a historic event is made visible in Wikipedia. March 31: 1492 – The Catholic Monarchs of Spain issued the Alhambra Decree, ordering all Jews to convert to Christianity or be expelled from the country. The event must have happened on a single day, so not a crisis or war, but a precipitating or concluding event such as the signing of a treaty. Births and deaths have their own process for appearing on the front page, so do not qualify for this collection of facts. It must be an event with notable repercussions: one notable figure marrying another, or writing a letter to another, is not always significant in itself, but can be significant by initiating other events. There must be no controversy about the day on which it happened. Reputable sources should agree. The fact must be backed up by at least one reliable source, which must be cited in the article. As with all Wikipedia references, paywalled sources are fine but open-access sources have an advantage because they can be checked by Wikipedians outside subscribing institutions. With software developments over the last couple of years, adding citations has become extremely easy: the Cite tool expands DOIs into full citations and normally succeeds in transforming web links into full citations. The fact must be stated in the “home” article, in this case Alhambra Decree. It can also go in the articles about the calendar date and the year. There are English Wikipedia articles about the year 1492 and about the date March 31. Unlike most Wikipedia articles, these are essentially lists of facts under different headings. It can also appear in the biographies of the people, organisations or nations involved (in this case, Isabella of Castille). Some topics have timeline articles which are essentially lists of dates, such as Timeline of Spanish history. The articles about individual dates, such as March 30, also have lists of births and deaths. In the long term, these will probably be driven by Wikidata, which is ideal for this kind of data. These lists have the same relative paucity of dates before 1800, and the same requirement that dates should be sourced and uncontroversial. Facts for a particular day are chosen well in advance by an administrator, working behind the scenes in an area called the Selected anniversaries project. It is accepted, even encouraged, for other users to proactively edit in their own suggestions if they know wiki-code. The listing is decided two to four days in advance, so include your suggestion further in advance than that. The guidelines give preference to events with a significant anniversary (meaning a multiple of 25, e.g. a 325th anniversary), events that differ from the others on the list (in era or geography), and articles that have not been on the front page before. “On this day” articles do not have to be comprehensive, but should be good examples of Wikipedia articles with citations in all sections. Each day’s “staging area” has a list of events that were submitted but did not qualify. Usually the article is rejected for having insufficient citations, so by improving the articles with links to scholarly sources, we can help those links reach the front page. So there is an opportunity here for heritage organisations and historians to extend awareness of the turning points of history, and the use of biographical papers or databases. We just need to succinctly describe the key events and share citations about them.